If leaks from a Russian gaming magazine are to be believed, Gears of War 3 will be like Waterworld: A flooded world, man-made islands, and Kevin Costner. Maybe not Kevin Costner. We know a bit about Gears of War 3 already: We know that it's being written by an acclaimed Star Wars novelist, and we know that it features humanity's last, last stand, with former noncombatants pitching into fight (like one-time support character Anya). Now, thanks to scans of a Russian gaming mag, we might know more. There are quite a few juicy tidbits of information here, but they're also potential spoilers, so consider yourselves under the effects of a SPOILER ALERT: YOU'RE ABOUT TO GET SPOILED. According to translations on the Epic forums, Gears 3 takes place 18 months after the end of Gears 2, and the entire planet has been flooded. Humanity has been fractured, with the government collapsing and everybody else taking to the seas, splitting up into "tribes" that fend for themselves. Much of the Gears 3 story will allegedly take place on (and in, and beneath) "Raven's Nest," a man-made island created by lashing multiple warships together. Marcus Fenix is returning as the protagonist, of course, and will be joined by Dom, Cole, Baird, Anya, and surprisingly Marcus' father Adam. Baird and Cole will get their own storyline in the game, doubling the series' BQ (or "Bromance Quotient"). 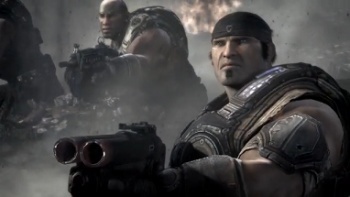 The magazine claims that while Gears 3 will end Marcus Fenix's story, Epic isn't done with the franchise yet, and could venture into prequel or spin-off territory, even with games in completely different genres. Do I hear COG Kart and Dom's Lancer Training? I think I do! Gears 3 will also have mechs called "Silverbacks" if the magazine is to be believed (Funk sidenote: YESSSSSSSSSS), and the difficulty will be a bit dialed back - Epic's statistics show that 60% of players never beat Gears 2, and they'd like to change that. There's a lot of interesting stuff here, to be sure - but how much of it is real? The scans look legitimate, but a Tweet from Epic frontman Cliff Bleszinski throws it into question: "Please don't trust badly translated leaked scanned info on Gears 3. Lots of false info out there." So I guess reports that Marcus Fenix will be growing gills on his neck remain unconfirmed.